Protest in front of the Italian Embassy in Tunis on 6 September 2018 calls for immediate release of fishermen held in prison in Italy since 29 August 2018 Photo: Paul Scheicher. All rights reserved. After hours of waiting for a response, though, the men decided to tow the smaller boat in the direction of Lampedusa – Italy’s southernmost island, to help Italian authorities in their rescue operations. At around 24 miles from Lampedusa, the Guardia di Finanza (customs police) took the fourteen people on board, and then proceeded to violently arrest the six fishermen. According to the precautionary custody order issued by the judge in Agrigento (Sicily), the men stand accused of smuggling, a crime that could get them up to fifteen years in jail if the case goes to trial. The fishermen have since been held in Agrigento prison, and their boat has been seized. 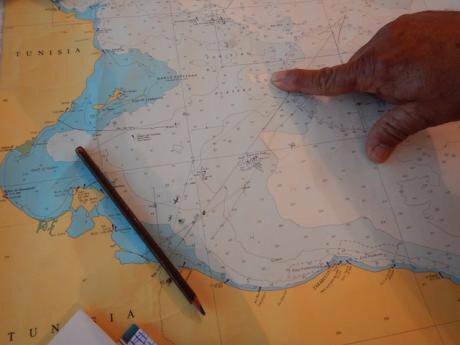 A map of where the fishermen of Zarzis work, in the open sea between Libya and Sicily. Valentina Zagaria. All rights reserved.This arrest comes after a summer of Italian politicians closing their ports to NGO rescue boats, and only a week after far-right Interior Minister Matteo Salvini prevented for ten days the disembarkation of 177 Eritrean and Somali asylum seekers from the Italian coastguard ship Diciotti. It is yet another step towards dissuading anyone – be it Italian or Tunisian citizens, NGO or coastguard ships – from coming to the aid of refugee boats in danger at sea. Criminalising rescue, a process that has been pushed by different Italian governments since 2016, will continue to have tragic consequences for people on the move in the Mediterranean Sea. 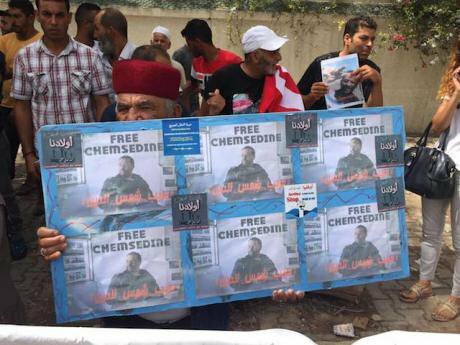 Among those arrested is Chamseddine Bourassine, the president of the Association “Le Pêcheur” pour le Développement et l’Environnement, which was nominated for the Nobel Peace Prize this year for the Zarzis fishermen’s continuous engagement in saving lives in the Mediterranean. Chamseddine, a fishing boat captain in his mid-40s, was one of the first people I met in Zarzis when, in the summer of 2015, I moved to this southern Tunisian town to start fieldwork for my PhD. On a sleepy late-August afternoon, my interview with Foued Gammoudi, the then Médecins Sans Frontières (MSF) Head of Mission for Tunisia and Libya, was interrupted by an urgent phone call. “The fishermen have just returned, they saved 550 people, let’s go to the port to thank them.” Just a week earlier, Chamseddine Bourassine had been among the 116 fishermen from Zarzis to have received rescue at sea training with MSF. Gammoudi was proud that the fishermen had already started collaborating with the MSF Bourbon Argos ship to save hundreds of people. We hurried to the port to greet Chamseddine and his crew, as they returned from a three-day fishing expedition which involved, as it so often had done lately, a lives-saving operation. : Chamseddine Bourassine and Slaheddine Mcharek in the “Le Pecheur” Association headquarters in Zarzis. Valentina Zagaria. All rights reserved.The fishermen of Zarzis have been on the frontline of rescue in the Central Mediterranean for over fifteen years. Their fishing grounds lying between Libya – the place from which most people making their way undocumented to Europe leave – and Sicily, they were often the first to come to the aid of refugee boats in distress. “The fishermen have never really had a choice: they work here, they encounter refugee boats regularly, so over the years they learnt to do rescue at sea”, explained Gammoudi. For years, fishermen from both sides of the Mediterranean were virtually alone in this endeavour. Before the Tunisian revolution of 2011, Ben Ali threatened the fishermen with imprisonment for helping migrants in danger at sea – the regime having been a close collaborator of both Italy and the European Union in border control matters. During that time, Tunisian nationals attempting to do the harga – the North African Arabic dialect term for the crossing of the Sicilian Channel by boat – were also heavily sanctioned by their own government. Everything changed though with the revolution. “It was chaos here in 2011. You cannot imagine what the word chaos means if you didn’t live it”, recalled Anis Souei, the secretary general of the “Le Pêcheur” association. In the months following the revolution, hundreds of boats left from Zarzis taking Tunisians from all over the country to Lampedusa. Several members of the fishermen’s association remember having to sleep on their fishing boats at night to prevent them from being stolen for the harga. Other fishermen instead, especially those who were indebted, decided to sell their boats, while some inhabitants of Zarzis took advantage of the power vacuum left by the revolution and made considerable profit by organising harga crossings. “At that time there was no police, no state, and even more misery. If you wanted Lampedusa, you could have it”, rationalised another fisherman. But Chamseddine Bourassine and his colleagues saw no future in moving to Europe, and made a moral pact not to sell their boats for migration. 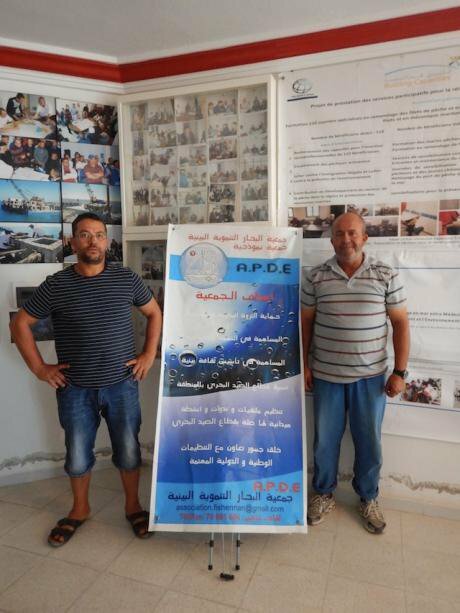 They instead remained in Zarzis, and in 2013 founded their association to create a network of support to ameliorate the working conditions of small and artisanal fisheries. The priority when they started organising was to try and secure basic social security – something they are still struggling to sustain today. With time, though, the association also got involved in alerting the youth to the dangers of boat migration, as they regularly witnessed the risks involved and felt compelled to do something for younger generations hit hard by staggering unemployment rates. In this optic, they organised training for the local youth in boat mechanics, nets mending, and diving, and collaborated in different international projects, such as NEMO, organised by the CIHEAM-Bari and funded by the Italian Ministry of Foreign Affairs Directorate General for Cooperation Development. This project also helped the fishermen build a museum to explain traditional fishing methods, the first floor of which is dedicated to pictures and citations from the fishermen’s long-term voluntary involvement in coming to the rescue of refugees in danger at sea. This role was proving increasingly vital as the Libyan civil war dragged on, since refugees were being forced onto boats in Libya that were not fit for travel, making the journey even more hazardous. With little support from Tunisian coastguards, who were not allowed to operate beyond Tunisian waters, the fishermen juggled their responsibility to bring money home to their families and their commitment to rescuing people in distress at sea. Anis remembers that once in 2013, three fishermen boats were out and received an SOS from a vessel carrying roughly one hundred people. It was their first day out, and going back to Zarzis would have meant losing petrol money and precious days of work, which they simply couldn’t afford. After having ensured that nobody was ill, the three boats took twenty people on board each, and continued working for another two days, sharing food and water with their guests. Sometimes, though, the situation on board got tense with so many people, food wasn’t enough for everybody, and fights broke out. Some fishermen recall incidents during which they truly feared for their safety, when occasionally they came across boats with armed men from Libyan militias. It was hard for them to provide medical assistance as well. Once a woman gave birth on Chamseddine’s boat – that same boat that has now been seized in Italy – thankfully there had been no complications. During the summer of 2015, therefore, Chamseddine felt relieved that NGO search and rescue boats were starting to operate in the Mediterranean. The fishermen’s boats were not equipped to take hundreds of people on board, and the post-revolutionary Tunisian authorities didn’t have the means to support them. MSF had provided the association with first aid kits, life jackets, and rescue rafts to be able to better assist refugees at sea, and had given them a list of channels and numbers linked to the Maritime Rescue Coordination Centre (MRCC) in Rome for when they encountered boats in distress. They also offered training in dead body management, and provided the association with body bags, disinfectant and gloves. “When we see people at sea we rescue them. It’s not only because we follow the laws of the sea or of religion: we do it because it’s human”, said Chamseddine. But sometimes rescue came too late, and bringing the dead back to shore was all the fishermen could do. During 2015 the fishermen at least felt that with more ships in the Mediterranean doing rescue, the duty dear to all seafarers of helping people in need at sea didn’t only fall on their shoulders, and they could go back to their fishing. The situation deteriorated again though in the summer of 2017, as Italian Interior Minister Minniti struck deals with Libyan militias and coastguards to bring back and detain refugees in detention centres in Libya, while simultaneously passing laws criminalising and restricting the activity of NGO rescue boats in Italy. Media smear campaigns directed against acts of solidarity with migrants and refugees and against the work of rescue vessels in the Mediterranean poured even more fuel on already inflamed anti-immigration sentiments in Europe. In the midst of this, on 6 August 2017, the fishermen of Zarzis came face to face with a far-right vessel rented by Generazione Identitaria, the C-Star, cruising the Mediterranean allegedly on a “Defend Europe” mission to hamper rescue operations and bring migrants back to Africa. The C-Star was hovering in front of Zarzis port, and although it had not officially asked port authorities whether it could dock to refuel – which the port authorities assured locals it would refuse – the fishermen of Zarzis took the opportunity to let these alt-right groups know how they felt about their mission. Protest in Zarzis against the docking of the alt-right ship C-Star, 6 August 2017. Valentina Zagaria. All rights reserved.Armed with red, black and blue felt tip pens, they wrote in a mixture of Arabic, Italian, French and English slogans such as “No Racists!”, “Dégage!” (Get our of here! ), “C-Star: No gasoil? No acqua? No mangiato?” ?” (C-Star: No fuel? No water? Not eaten? ), which they proceeded to hang on their boats, ready to take to sea were the C-Star to approach. 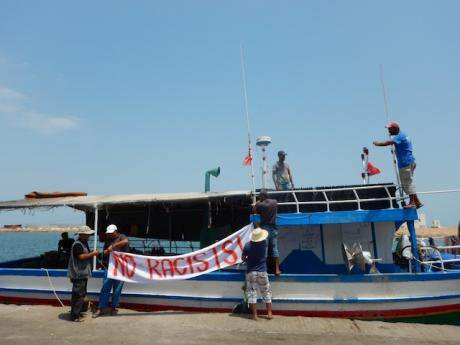 Chamseddine Bourassine, who had returned just a couple of hours prior to the impending C-Star arrival from five days of work at sea, called other members of the fishermen association to come to the port and join in the peaceful protest. He told the journalists present that the fishermen opposed wholeheartedly the racism propagated by the C-Star members, and that having seen the death of fellow Africans at sea, they couldn’t but condemn these politics. Their efforts were cheered on by anti-racist networks in Sicily, who had in turn prevented the C-Star from docking in Catania port just a couple of days earlier. It is members from these same networks in Sicily together with friends of the fishermen in Tunisia and internationally that are now engaged in finding lawyers for Chamseddine and his five colleagues. 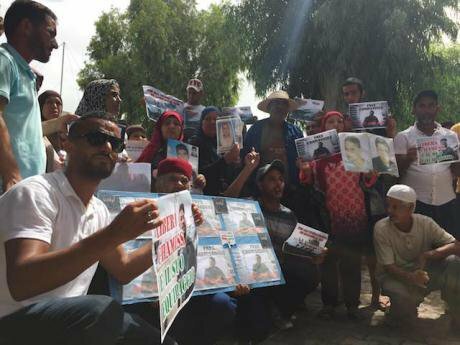 Their counterparts in Tunisia joined the fishermen’s families and friends on Thursday morning to protest in front of the Italian embassy in Tunis. Three busloads arrived from Zarzis after an 8-hour night-time journey for the occasion, and many others had come from other Tunisian towns to show their solidarity. Gathered there too were members of La Terre Pour Tous, an association of families of missing Tunisian migrants, who joined in to demand the immediate release of the fishermen. A sister protest was organised by the Zarzis diaspora in front of the Italian embassy in Paris on Saturday afternoon. Fishermen networks from Morocco and Mauritania also released statements of support, and the Tunisian State Secretary for Immigration Adel Jarboui urged Italian authorities to release the fishermen, who are considered heroes in Tunisia. The fishermen’s arrest is the latest in a chain of actions taken by the Italian Lega and Five Star government to further criminalise rescue in the Mediterranean Sea, and to dissuade people from all acts of solidarity and basic compliance with international norms. This has alarmingly resulted in the number of deaths in 2018 increasing exponentially despite a drop in arrivals to Italy’s southern shores. While Chamseddine’s lawyer hasn’t yet been able to visit him in prison, his brother and cousin managed to go see him on Saturday. As for telling them about what happened on August 29, Chamseddine simply says that he was assisting people in distress at sea: he’d do it again. Protest in front of the Italian Embassy in Tunis on 6 September 2018. Paul Scheicher. All rights reserved. Interior Minister Matteo Salvini has been charged with kidnap and abuse of power as a result of his actions during the Diciotti case. A couple of days before news of the six fishermen being arrested became public, on 1 September 2018, French media Konbini News created a crowd-funding campaign to sustain the work of another member of the fishermen’s association “Le Pêcheur”. 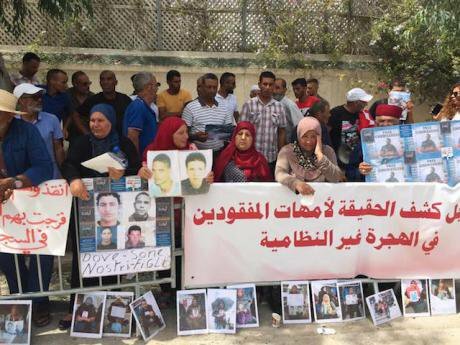 They launched an appeal to help Chamseddine Marzoug in upkeeping and buying new land for the cemetery of unknown persons, victims of the European Union’s Mediterranean border, buried in Zarzis. Images from the protest against the C-Star and of the fishermen’s association’s work can be seen in Giulia Bertoluzzi’s documentary Strange Fish, coming out on 15 September 2018.